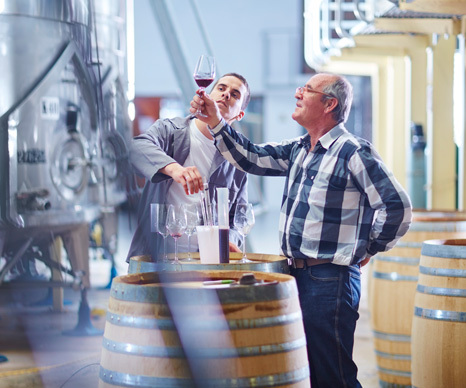 CLEAResult works with utilities to help wineries and dairies manage energy and water use with a comprehensive range of options, including unbiased technical service, education and support. Our customized and scalable energy management approach addresses electricity, demand and water savings potential. Utilities often consider agricultural customers, such as dairies and wineries, to be "hard to reach" because of their rural locations and specialized equipment. And, just as often, agricultural customers don't see the benefit of utility programs that don't appear to be catered to their specific needs. At CLEAResult, we've spent years building relationships with agricultural business owners and developing a deep understanding of the driving forces behind the markets they operate in. Our years of experience and expertise partnering with utility providers put CLEAResult in the ideal position to serve as a bridge between utilities and their agricultural customers. We specialize in effectively communicating the value of energy-saving utility programs because we know the customer and speak their language. We're as comfortable recommending barrel washing upgrades and heat reclamation measures to a winery as we are suggesting an innovative milk-cooling system to a dairy. Along the way, we reduce demand and save energy for utilities and agricultural clients alike. As the only energy efficiency consulting firm serving California wineries and dairies, our programs have been directly supporting two of the state's top commodities since 2006.